You are here: Home / Preschool STEM / Storytime STEAM with 10 Apples Up on Top! Storytime STEAM with 10 Apples Up on Top! Storytime STEAM combines your favorite books with a simple STEAM challenge. 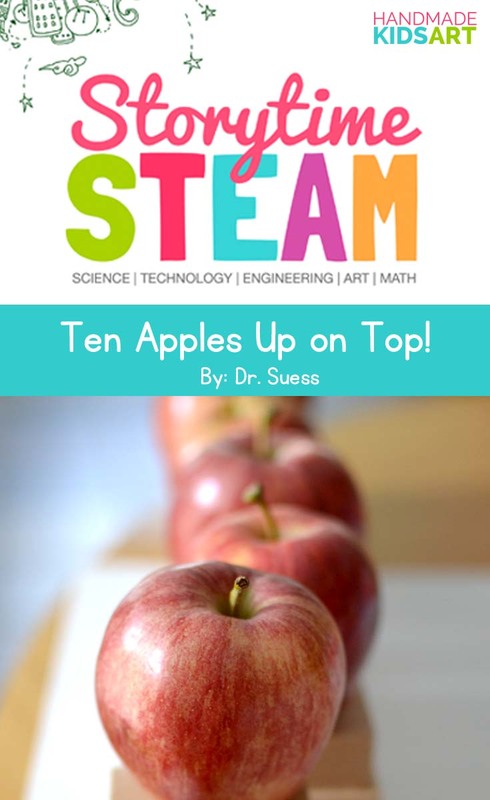 This week we are exploring a Dr. Seuss classic, Ten Apples Up on Top. STEAM is the combination of Science, Technology, Engineering, Art, and Math. STEAM activities help promote essential 21st-century skills, which is important in preparing our children for the future. This post contains affiliate links to products I personally recommend. Click here to read my full disclosure policy. Thank you for supporting Hand Made Kids Art. A STEAM challenge is designed for children to help inspire creativity, collaboration, communication, and encourage critical thinking, otherwise known as the 4 C’s. You do not need expensive or fancy equipment to set up STEAM activities for children. In fact, for this preschool steam activity, you only need two materials. Read the full challenge below! Objective: Build a structure that can support ten apples. Prior to starting the STEAM challenge we tried stacking our apples. We couldn’t get past two apples. We discovered stacking apples was a lot harder than when we stacked rocks! Why is it hard to stack the apples? What other types of fruit might be easier to stack? STEAM Challenge: Can you build a structure that can support 10 apples? Read the story, Ten Apples Up on Top! Ask: How can we build a structure that can support 10 apples? Plan: Discuss and collaborate together or in small groups. Improve: Discuss how you can improve your building. Allow students time to redesign their structure. Can you hold more than 10 apples? Share: Draw a picture of your final structure. Share with parents or other classmates. Science: What are the different parts of an apple? Engineering: Construct a structure that can hold 10 apples. Art: Draw a picture of your structure. 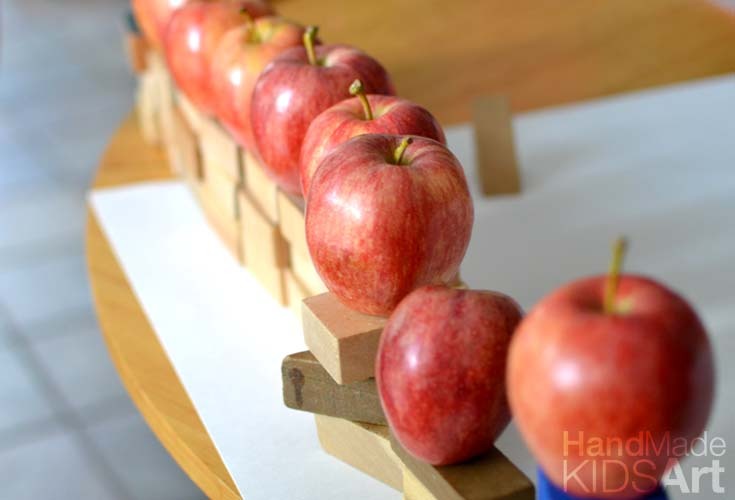 Math: Count how many apples can you stack? Sort the apples by size.